Widowed by war, Maura O’Connor has raised her son alone under the weight of poverty in the unforgiving slums of New York City. That harsh and difficult life has taken a toll on them both. 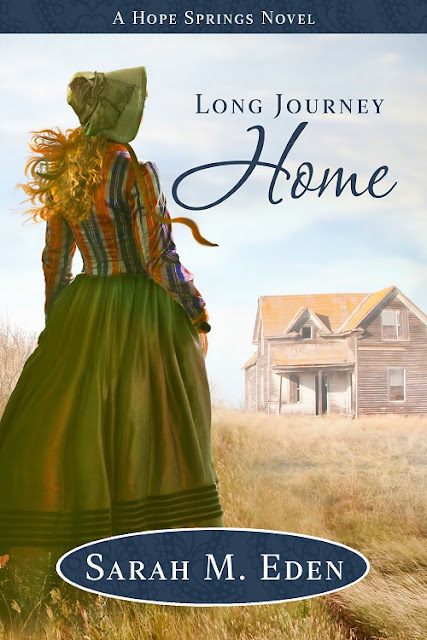 Desperate to save her son from the misery around them, she moves them both to the tiny western town of Hope Springs, where her late husband’s family lives, hoping that the decade of silence between them does not mean she and Aidan will be rejected outright. Her son needs family, and she would endure anything to see him happy. Ryan Callaghan has worked the land belonging to the late Granny Claire for years, dreaming of one day claiming it as his own. Living in his brother’s home affords him no freedom, no stability, no joy. The arrangement is even harder on his mother, whose health is quickly deteriorating. A risky investment in the land has finally begun to pay off, and he is at last in a position to secure a better future for them both. When use of the home is, without warning, offered to a newly arrived widow and her son, that future is entirely uncertain. Another amazing addition to the series! I think each book just gets better and better as we come to know the O'Connor family and their community in Hope Springs even more. I loved the way the author incorporated the main characters from previous books in meaningful ways, not just appearances for the sake of having their names in the book. Also, without doing a plot rehash of the previous books. These can be read out of order, but meeting them Long Journey Home will definitely make you want to go back and read the stories of the other characters. It took me a little bit to get a feel for Maura, but I grew to love her and understand her as she allows herself to open up to her O'Connor family and accept their unconditional love and support in the midst of her hardships and theirs. Ryan is someone who is easy to admire with his compassion for his mother, strong work ethic, and service to his community. I loved seeing Maura and Ryan develop a friendship in spite of their conflicting goals, and the way they sacrificed for each other. The sweet romance between them grew slowly and naturally, and their special moments together are even more so because of that wait. Maura's son Aiden was also an important member of this story and I thought he was realistically portrayed and enjoyed seeing him blossom in Hope Springs. There are strong themes of family, service, sacrifice, and community. I thoroughly enjoyed every page of this wonderful book!